probably somewhat -- I mean, you have to have the side -- because it's frustrating when you're not getting all the results that you want and you have to look at every aspect of your system. flaws. And see if you agree at your table. Table leaders, take over and watch for the sign for everyone to come back, okay? Go. the ones on the left could actually be pulled over to the right-hand side as well with a different explanation. Go! Okay! Thank you. Again, I know you're not finished with the conversation. sorry, I'm a little random. I'll be sequential for you, but I change my mind about the order of things. So if I were you, I'd kind of put the handout aside. Know there are some key slides. kids, I told you when the test was going to be, that's your chance, and it's over, if I can do that, then erase number three from your list. Don't have it on your list and then violate it. what extent do you think you live in a -- live do you -- well, kind of live. Do you work in a culture that has professional norms and clear beliefs about learning that drive your decisions? Four means you're really good at that, one means not so much, we kind of get along and have good donuts, but that's it. Okay? One minute at your table and then I'm going to interrupt you. Go. Thanks. Again, I know these are longer conversations, I get that, but these are very long conversations. They should never end. feedback has to make sure that the feedback from assessments -- that students have a clear picture of their progress on learning goals and how they might improve. We know that to be true. formative, which means it guides subsequent learning opportunities? To what extent do you think you're there already now? A four means high, a one means low. One minute at your table. standards-based report cards we would not call standards-based. When you get to standards-based, here's what we mean. Let me add that is on your journey. This is where you head next. level five. Now this does not mean they're in -- you know, we do the old-fashioned tracking where you have the eagles and the buzzards. This is not -- this is not what we're talking about. proficient and ready to move onto the next level? Can you see where the student has some strengths and weaknesses here? Okay? Now go to the second quarter. Okay, you see what happened there? this make sense to you? Have you seen this a lot? Yes, no? At your table. Again, in a setting like this, can't really take questions. confused about that, go to the primary. They'll tell you how to really do good learning centers. But everyone should because we don't all learn in the same time frame. So of course you do. know, something they're seeing, a video, whatever. But it's whole class. Then there are learning station times where kids are working on different things. This is beautiful to behold K-12. although there are other ways to do it. We won't get into that right now. So that's very important. So can you give regular grades? Yes. 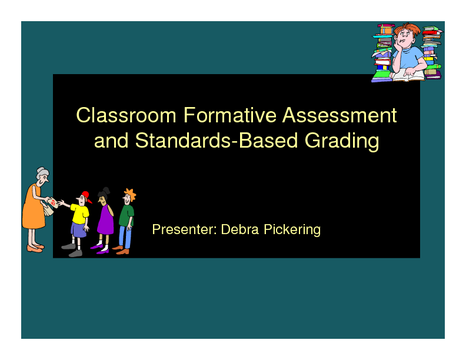 Do some grading practices need to be altered? Absolutely. So let me pause here. Some of the things that I have shared with you, you go, well, we're already there on this journey. Some of them maybe you say that would be our next step. some questions as well. Thank you very much.